First in the Kurt Wallander series. It was a senselessly violent crime: on a cold night in a remote Swedish farmhouse an elderly farmer is bludgeoned to death, and his wife is left to die with a noose around her neck. And as if this didn't present enough problems for the Ystad police Inspector Kurt Wallander, the dying woman's last word is "foreign," leaving the police the one tangible clue they have-and in the process, the match that could inflame Sweden's already smoldering anti-immigrant sentiments. 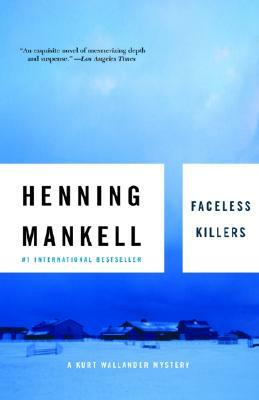 Unlike the situation with his ex-wife, his estranged daughter, or the beautiful but married young prosecuter who has peaked his interest, in this case, Wallander finds a problem he can handle. He quickly becomes obsessed with solving the crime before the already tense situation explodes, but soon comes to realize that it will require all his reserves of energy and dedication to solve.